Nothing in Olivier Magne's storied career could have prepared him for this moment. It was literally all Greek to him. Standing before a group of players on a dusty track overlooked by olive trees, one of the finest flank forwards the game had ever seen was struggling now to comprehend just how he could impart even a little of his knowledge to Greece's international rugby team. So he just started at the beginning. For how else can you mean to go on? This farmer's son from the Auvergne had fulfilled his own journey and now it was time to give something back to the game he loved. It is a philosophy that underpins everything he believes in. "I'm still looking," he tells us from home. "I coached Brive, the French amateurs, French 'A', U-20s, in the second division, Greece, ten years ago. Nothing changes. It is the same game. My approach is the same. I just love the game. Whether it is adults or children. "Everyone is different but the game is the same. And you can see the evolution very quickly. In Greece, their passion and ambition to be the best they can be is just like anyone else. Why can't everyone be allowed to share that?" He has always striven to give more than he takes; hard to do much else when he has offered so much in the first place. Magne was one of the sport's most flamboyant talents, befitting one who featured in arguably one of the greatest games of the last 25 years, France's Twickenham coup in a World Cup semi-final in New Zealand in 1999. 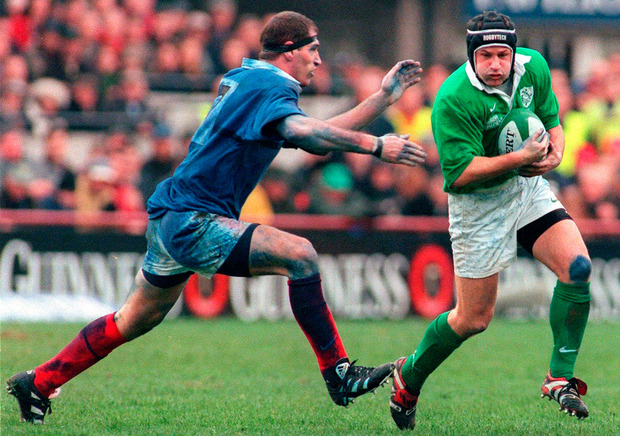 Whether dying his hair or firing imaginary pistols into the crowd in the act of celebrating a try, for a decade between 1997 and 2007, Magne colourfully reimagined the position of the openside akin to a modern-day Jean-Pierre Rives. Like his side, so often he seemed untouchable; their 2003 dismissal of Ireland in Melbourne a summit of their dominance; he would lose just twice in ten meetings. The current French team have won just three times in the last ten. When Magne sees France now, he does so with a confection of angst and anticipation, at what is being wasted but also at what could be achieved. In his eyes, the rot set in when France lost the 2011 World Cup final by just one point to New Zealand; like Icarus, that day so close to the searing sun would soon propel them on a stunning slump towards ground zero. "We lost a sense of who we were," says the 45-year-old, a pundit for Eurosport this weekend. "People were happy to get to the final in 2011 but it was not a good tournament for us. Comment on d'it? We could not see the woods for the trees. We didn't have the distance to analyse what was going on underneath. "We needed to have a vision for the next ten years but we didn't do it and that's why we are falling behind countries like Wales and Scotland, never mind New Zealand and Ireland. "We have to return to our way of playing. This is our identity, it is in our culture, it is our legacy. We have been focused on playing with structure for a long time. "If we want to play our own game, we need young players with speed and vision. At the moment, we are not really able to play like that with 15 players. You need to speak the same language. If another player doesn't see the opportunity, it's very hard to organise any game. "The new generation are more of the rugby of movement and creativity. So we need to maintain this path. We need to build around these players and that will give us the chance to restore our status in the modern game. "But it's always the same thing in France. We talk and talk but never take any action to change things. We need to say enough is enough. "We need unity. It will be better for everyone if there is a united front because without an international team you have no soul. If we don't do it, we die." He sees his sport not only through a blue prism. The crisis engulfing the global game now also saddens him. "Rugby is at the point now where it needs a revolution to grow the game but everywhere there are financial problems everywhere you look," says the one-time London Irish man. "Even England, with all the revenue from Twickenham, it is not enough. So we need to think about different competitions and it needs to have universal attention to attract more media and more money. "But we need to be careful because we have to maintain the difference between rugby and other sports. There needs to be a balance so rugby can keep its spirit. And it needs to think of the new world and not just the old world of the Six Nations. We need to be open. "Of course it can be cruel for a team who may lose their place in the top table for three years but what about those who are excluded for all time? "We need to embrace others. We need to be honest. For there is competition in life as well. When you struggle in work or finish in the bottom, you have to think about what you need to do and get back to the top." He senses a slow journey for his native land - "our crisis of growing" - but the Toulouse-inspired youth make him smile. So does Ireland. "Yes, we always won but in the beginning, they were the only team with whom we would mix at the post-match banquet. Good times." Ireland will maintain the trend of eminence in this fixture, he agrees. 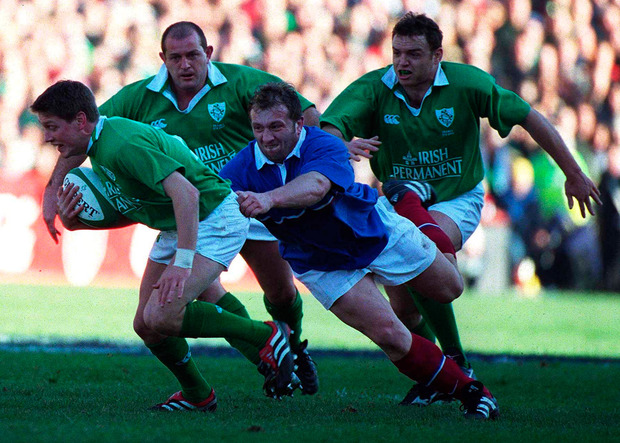 "France will be dangerous but Ireland are just so consistent. It will show France how much they need to climb," he sighs. And, in the time since he left them, how far they have fallen.